I have been watching and studying this tree for a couple of years now. 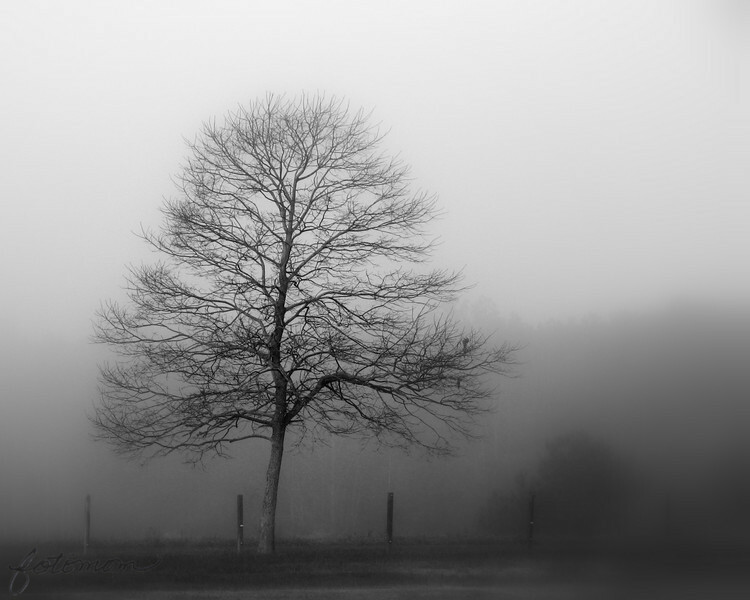 Whenever there is fog, it seems to stand out from the backdrop...a solitary, lonely figure. I finally made up my mind yesterday to figure out where to park the car to get out to take a picture...not a small feat. I do try to stay safe, but this location is more precarious than some. Most days I am joyful as I spend time with the kids. My life is full of laughter and color; it's vibrant and full of life like many of my pictures. But some days at least deep inside it is like this too. I guess a bit of that side is slipping through today. I stopped to think about my mother for a few minutes when I took this. She was involved in a horrible traffic accident with a tractor trailer on a foggy morning in November just before Thanksgiving in 1985. For me, the fog will always be more than just the fog. Thanks for your comments on Johnny and the Jon boat. It was as serene out there as you thought. Little wind, warm sun on our skin, very few boats out on the lake...a calming hour without the chaos of life. Glad to see this again Maryanne, because it's awesome! Absolutely stunning. This image takes my breathe away.